As a rule the modern yachts have all necessary things for comfortable rest or travel. The owners equip their "water homes" with love, equipping it with the newest equipment and considering interior design carefully. Among the original innovations providing comfort on the yacht is - Criohome ® - the newest hi-tech development of the German specialists. 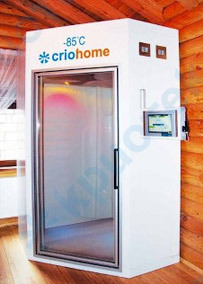 Criohome ® - is the air cryosauna with temperature -85°С inside, designed specially for private use. It can become distinctive feature and highlight of your yacht, because not many people have such cryosaunas yet. Super or Mega-yacht will only win from this innovation, and the owner and his friends will receive remarkable opportunity to combine their rest with health improving procedures. Place economy means much in the limited space of the yacht, but Criohome ® is compact and can be installed in the internal premises without problems. The gym room, SPA area and even the wardroom - a place for cryosauna can be found anywhere, it will be perfectly fit both in modern and in classical interior. It is also possible to choose color of the cryosauna cabin suitable to colour of the room. Air cryosauna Criohome ® on the yacht will make travel more comfortable. 3 minutes in the cryosauna followed 20-25 minutes of the rest give charge of vivacity, energy and excellent mood for the whole day - and you are ready to conquer seas and oceans again and again!